Soup Tureen w. Strip Knob – Chinese Bouquet Turquoise / Apponyi ATQ3-PT pattern. Herend fine china – 23-0-07 ATQ3-PT – Turquoise w. Platinum design. Soup Tureen w. Strip Knob – Herend Chinese Bouquet Turquoise / Apponyi ATQ3-PT pattern. The Soup Tureen is available in larger and smaller volume too. 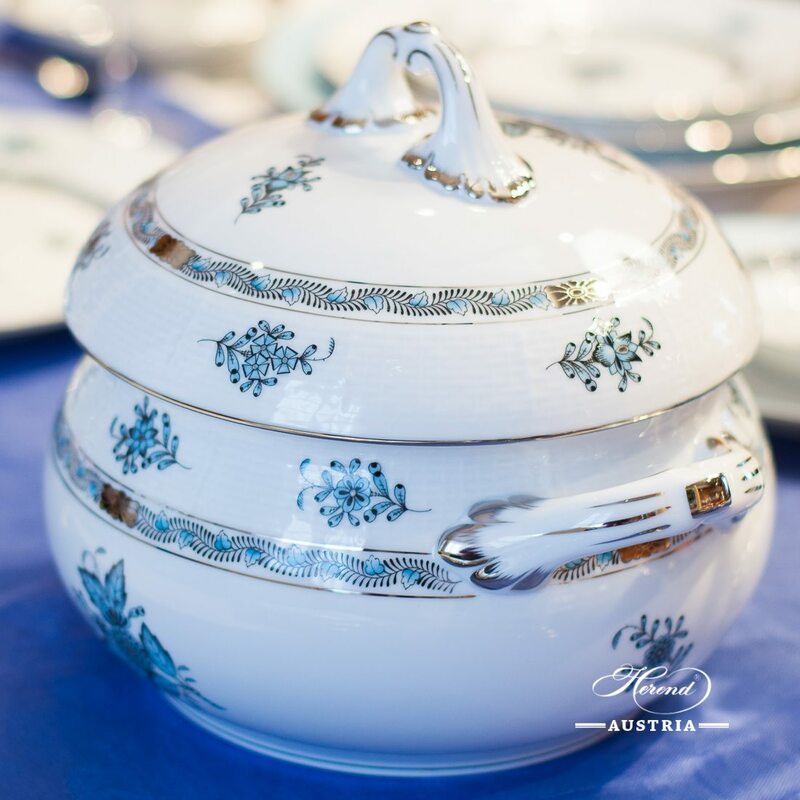 The Soup Tureen is an ideal choice to all Apponyi ATQ3-PT Dinner Sets. Apponyi Turquoise Milk Jug - 658-0-00 ATQ3-PT - Herend Porcelain The Milk Jug is part of the Essential Coffee Set. Of course you can buy it separately as well. The Milk Jug is available in larger volume too. The ATQ3-PT decor is a modern variant which painted with Turquoise colour and Platinum edge. For those people we recommend who like modern style pattern and modern colour version. Dessert Plate - Chinese Bouquet Turquoise / Apponyi ATQ3-PT pattern. Herend fine china - 1518-0-00 ATQ3-PT Turquoise w. Platinum design. The classic Apponyi design is also known as Chinese Bouquet. Tea, Coffee, Espresso Sets and Dinner Services are available.